– Christian Lacroix Haute Couture dress. First, I started with the window on Wednesday afternoon (the rest of my textile pieces are going up on Friday night); and way back when I was first planning the window display for the show – my immediate thought was a collaborative one – between me and friend, fellow designer Lara Blackman of Jayne. 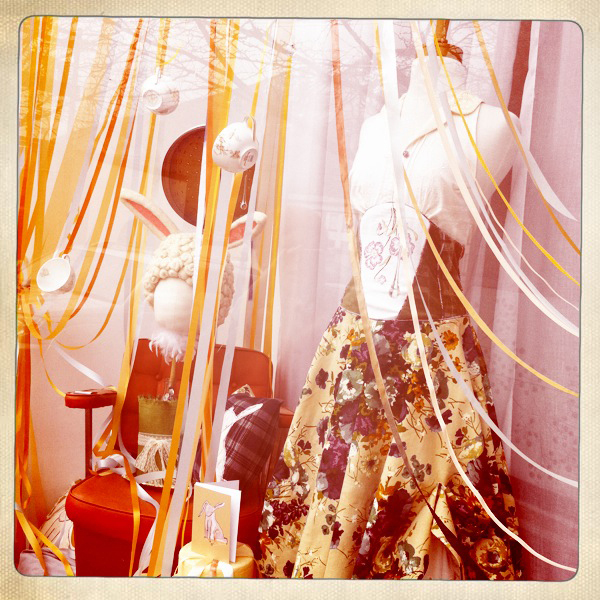 She makes divine dresses and I wanted one in my window! She currently has a pretty sweet project on the go over at smalltownfrocks – she’s making one couture dress per month, the one featured at my show is the March dress, #6. So, with ingredients for the window like blue floral tea party dresses and white rabbits a girl’s imagination really took off like a March Hare – and with the help of my sister Lauren and her fella Andrew we rigged up a plethora of luminous satin ribbons – litterally dozens of them drape from above and spill into porcelain teacups, over three tier cakes, rabbits and around Lara’s March Dress. A little ribbon madness for sure! THE CAKE! 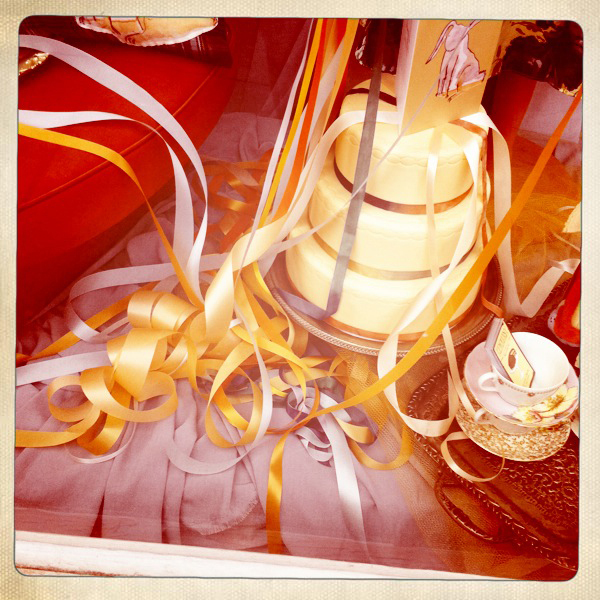 now this ingredient was one of the last pieces to fall down the rabbit hole… err into place – and as it’s in the window for a whole month, of course it’s a pretend cake, but all the same it is very pretty and is made of fondant, which smells heavenly. This beauty of a cake was made by Melissa Owen-Long, of Epiphany Cakes. Apart from three tier cake wonderfulness she is also very famous for her lemon squares (true romancers and window display co-pilots Lauren and Andrew will atest!). *below right – new Easter cards, available at Otter Books and Bijou. Drink me dress from the Helmut Lang made-to-measure studio. “Who are you? Said the Caterpillar – Hello Marc Jacob, hello Alice. Chapter 6: Pig and pepper… and Alice in Chanel Haute Couture embroidered satin jacket, satin skirt and cream leather boots. Karl Lagerfeld wears Chrome Hearts necklaces and belt. Alice, in Atelier Versace layered silk-tulle and chiffon-organza dress lined in lace. Donatella Versace, Rupert Everett in Versace. Olivier Theyskens designed this Rochas iridescent blue-flower ruffle dress on Alice. Vogue December issue 2003, did an Alice in Wonderland feature – these amazing fashion pages were photographed by Annie Leibovitz, modeled by Natalia Vodianova – and they’ve got me thinking about my party frock… and i am drawn to: lots of ruffles, ribbons and rabbits – and hopefully, a tophat or two! I should maybe mention something about the textiles I am producing! – the linen/cotton, organic cotton sateen, silk taffeta or the organic cotton knit jersey, are available by special order only for the time being. Prices per metre range from $58 – $78. For me, ordering small batches of the various designs allowed me to create a assortment of patchwork and appliqued one-of-a-kind cushions and wall hangings. You’ll see the odd piece of vintage fabric alongside my textiles within the handmade goods. Swatch books of the new fabrics will be on show on site on Saturday. 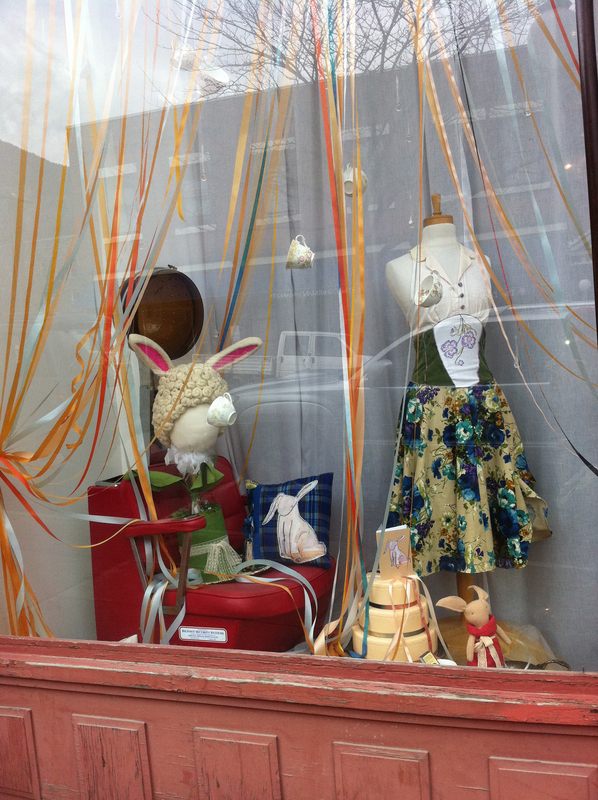 WHAT: drawn by illustration and design’s textiles launch party and art show opening! WHEN: Saturday April 2nd, 6pm. – The show continues for April. Last but not least, my very clever friend Jesse is catering the event.. more about all this in the next post of course!